I managed to "digitalize", clean up, and colour in another of my drawings. This one depicts St. George as a 13th century knight. I left out the usual saintly nimbus because I felt it would look peculiar with a great helm. I tried to make the horse and dragon look similar to horses and dragons in medieval art. I've always liked the composition of this one, and I'm glad I finally got it finished up on the computer. St. George as a 13th century knight. Thank you for posting this. I am also a fan of St. George in terms of subject matter. In fact, both St. George and St. Michael are amongst my favorites in terms of imagery. Strangely, I've been doing quite a lot of research on both over the last several weeks. I'm seriously considering one or the other as inspiration for an upcoming tattoo project. Looks grand! Saint George is the paragon of Chivalry, and always should be. Actually, How about one with a huge dragon? the dragon looks particularly good. My other St. George tackles a somewhat larger, more modern-looking dragon. I posted that one already on the "Richard Fay's Knightly Art" thread. I think they often depicted the dragons as small in medieval art because they used size to denote importance or holiness. Since the dragon was the epitome of evil, and your namesake was a saint, I think they were just following the standards of the day by making George big and the dragon small. I've seen a few depictions of the dragon that looked decidedly crocodilian. I used those as my inspiration for the 13th century St. George. I figure a crocodilian or lizard of this size would be a formidable threat to any community. Large predators were often a threat, especially prior to the introduction of firearms. I wouldn't want to tackle a dragon of this size with just a peasant's club or pitchfork, would you? I think really huge western dragons are more of a product of modern fantasy literature and role playing games, although this is not an absolute. Many medieval depictions show dragons as being much smaller than what you typically see in modern fantasy art. I think a scaly, fanged, fire-breathing beast the size of a horse is still pretty terrifying! I'm glad you all liked the drawing! I'm glad my art is finally appreciated by a wider audience than my immediate kin! Have you done him as a Roman yet (maybe i've missed it)? Hmm... Interisting theory you have there. I've never liked the tiny dragon, since it makes the good Saint look like a rat catcher. As to dragon sizes, wasn't Fafnir huge? What about the Dragon in Beowolf? It's been so long since I read the thing, and by the time I got to the dragon, well, I wasn't in a good mood with the verses anymore. Please, call me Richard! Calling me "Mr. Fay" makes me feel old! I'm not that old, yet! No, I have not gotten around to doing St. George as a Roman. I'm more interested in the medieval period, but that's a good idea. Show him as he might have truly been, instead of the later depictions. I'll have to consider doing that sometime! Like I said, my statement was far from an absolute. I think they were trying different methods with regard to the art than they were with regard to the literature. In the literature, making the dragons huge would make them more impressive villains, and make the destruction of one a more impressive act. I believe medieval literature (and later, for that matter) can be full of extreme hyperbole. Think of Roland's great feats in The Song of Roland! I think the visual arts often adhered to certain stylistic standards. Depicting holy or great individuals as larger than the other individuals was a common approach to emphasize their holiness or greatness. 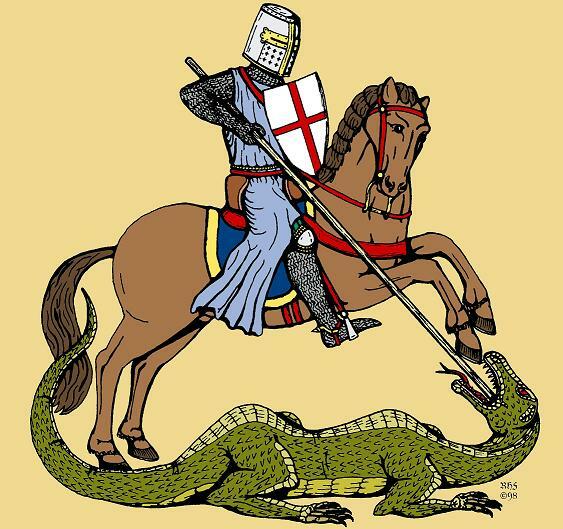 In the depictions of St. George slaying the dragon, the saint's holiness was much more important than the dragon, so they emphasized George, reducing the dragon to no more than an over-glorified rat in some instances! Thanks again for looking at my artwork!